It's expensive to be Erika Jayne, and someone needs to let Dorit and PK know that. While the majority of The Real Housewives of Beverly Hills Season 7 Episode 7 was focused on Kim Richards' sobierty (somethings never change), Dorit was not ready to let go of pantygate just yet. Erika Jayne filmed a new music video for her song "Xxpen$ive," and per usual, she didn't disappoint. And of course the two leaders of her fan club, Lisa Rinna and Eileen Davidson, were there to cheer her on. You can tell they desperately want to be invited to make a cameo in the video, but Erika is not picking up on their hints. Or she is and just ignoring them because she wants to make sure she makes it on the iTunes charts again. On the 4th week of pantygate, Dorit and PK are still trying to take down Erika. These two need a hobby. And Erika should write a song called "Pretty Little Puss." Meanwhile, Kyle cannot stop bragging about Mauricio this season, and his real estate company is getting a lot of attention. Portia secretly taking pictures of Vanderpump with different Snapchat filters on is everything. She is definitely a Real Housewife in the making. Or at least a SUR server. Permalink: When I do finally get a grandchild, I'm going to be Grandma Pinky. It didn't take long for Kim's conversation with Rinna at game night to come up at lunch. Nothing new is ever really said about the situation, but I'll take any opportunity to watch a Kim/Kyle flashback montage. 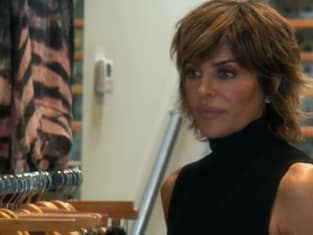 Of course Rinna and Eden are talking about it too. Surprisingly, Eden has a bigger problem with Kyle than Kim. She didn't get "good energy" from her. Eden reminds me so much of season four's Wicca witch Carlton, who also didn't like Kyle. Maybe Kyle wears garlic in her perfume to protect herself from witches. It wouldn't be a season of Beverly Hills if someone didn't accuse Kim of not being sober. This time Rinna took it to another level by calling Kyle Kim's "enabler" and saying Kim is "close to death." This is going to end well. Not. Seriously though, we should prepare to watch that scene a million times throughout the rest of the season and at least three times during the reunion. Rinna just can't help herself... and she knows what makes good TV. Eden wants to have lunch with Kyle to get to know her better after the bad vibes from game night. It took Eden about five minutes to ask about the Richards family history and to start crying over Kim. I'm not trying to take away from Eden's struggles, but it's bizarre to diagnose someone after you watched a few reruns of a show and cry about them over iced tea. Vanderpump is dealing with a while different kind of a family history because her son Max wants to find his birth parents. Lisa and Ken adopted Max 24 years ago, and it seems no amount of dogs can comfort her through this process (even though she brought multiple to the appointment with the adoption counselor). Ken wants to hire a private investigator to check out Max's parents before they approach them. They should just hire Kristen Doute. Erika Jayne has a performance in Greece, and Kyle is tagging along. The other women should have threatened to quit the show if they couldn't come on this trip. It's like the Sisterhood of the Traveling Pants... if Lena's grandparents were millionaires. Erika and I have very different lives. I'm still waking up and making breakfast for my kids, and snacks and carpool. And meanwhile she's being tossed up in the air by all these good-looking naked guys in Monakos. Back in the states, Dorit calls Rinna and Eileen to have lunch with her after the game night fight. She kind of apologizes, but she mostly just blames it on alcohol and turns the fight into Eileen's fault. Has Eileen ever been in a fight on this show that didn't become her fault? She should channel her soap character more often and stand up for herself. All of the girls agree to start over, forget the past and go to each other if they have a problem with one another. It reminded me a lot of middle school. Their guidance counselor would be so proud. Don't forget you can watch The Real Housewives of Beverly Hills online via TV Fanatic. Sarah Hearon is a staff writer for TV Fanatic. Follow her on Twitter.